Yes, it's been a while. I could list all the reasons why I haven't been blogging lately, but instead I'll keep it short and just say I'm glad to be back! It feels good to flex my culinary/photo muscles again. and what better way to get back into the swing of things, then with my favorite fruit ever...blueberries! 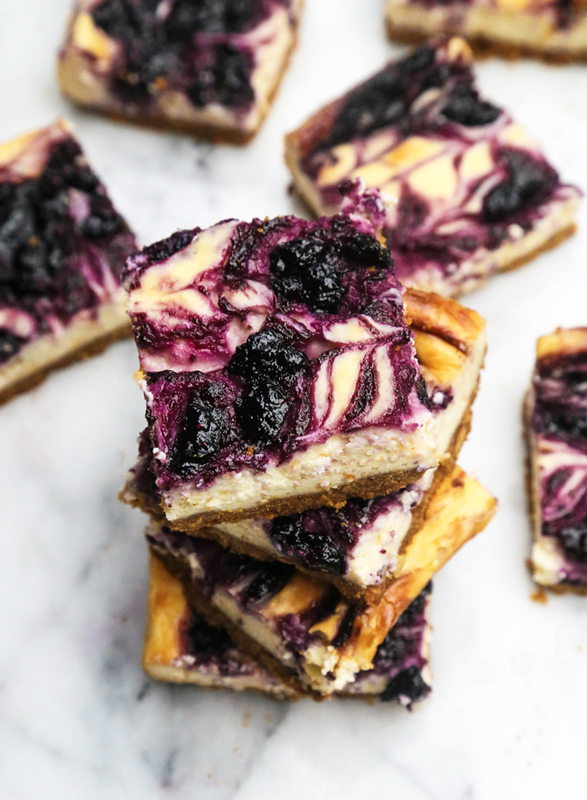 These Blueberry & Lemon Cheesecake Bars taste like summer. 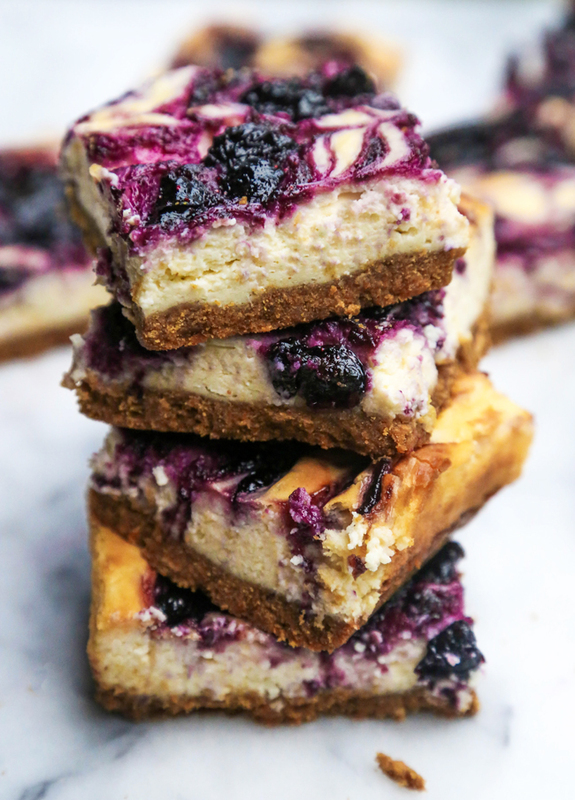 If summer were made with creamy, decadent cheesecake. The first step is to make the graham cracker crust. It's super easy, all you need are graham cracker crumbs and butter. Then, it's time to cook blueberries along with sugar to create a sweet, syrupy blueberry jam of sorts. You can use fresh or frozen blueberries, but while it's summer, I recommend using fresh. Lemon juice and lemon zest are added for a bit of freshness. In my opinion, lemons and blueberries were basically made for each other. 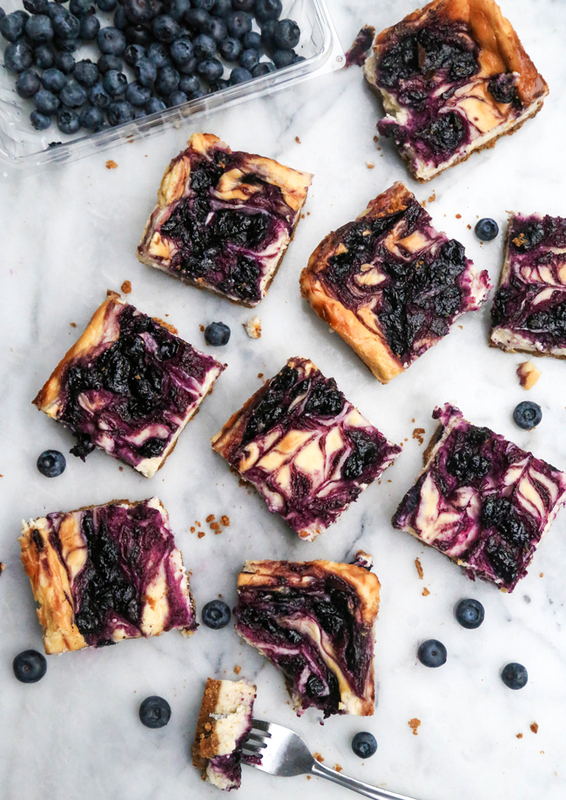 Speaking of blueberries and lemon, if you love this flavor combination as much as I do, check out my Blueberry Lemon Bars. They are crazy delicious! 1. Preheat oven to 350 degrees F. Line a 9x9 baking pan with aluminum foil. Set aside. 2. Use a blender or food processor to grind graham crackers into a fine crumb. Add to a large mixing bowl, and stir in melted butter. Mix until thoroughly combined. The texture should be similar to wet sand, and hold shape when squeezed. If it does not, add another tablespoon melted butter. 3. Press mixture into the bottom of the lined pan, making it as even as possible. Place in the oven and bake for 5 minutes. Remove from the oven and set aside. 4. Time to make the blueberry swirl! In a small saucepan on medium heat, add the fresh or frozen blueberries and granulated sugar. Stir to coat the blueberries in the sugar. 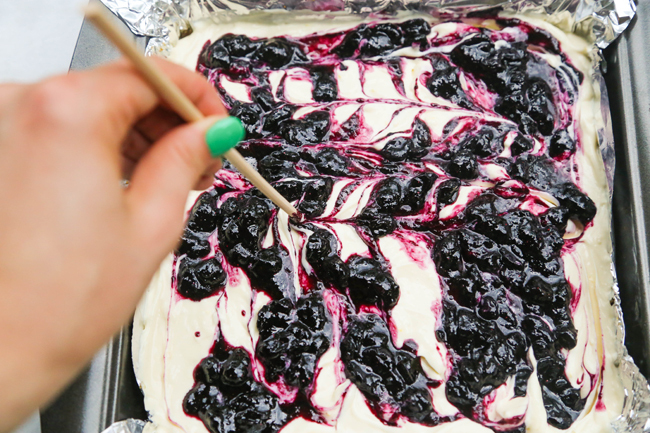 Allow the mixture to come to a boil, and begin to crush the blueberries with your mixing utensil as you stir. Allow the mixture to boil for about 10-15 minutes. Soon it will begin to reduce and become a sticky, juicy, and slightly thick texture. Remove from the heat and allow to cool. The mixture will cool as it thickens. 5. 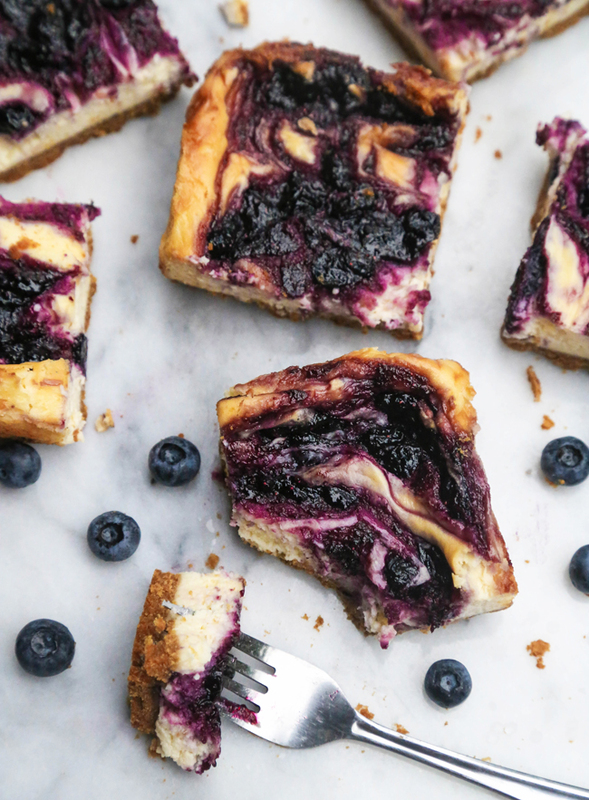 As the blueberries cool, add the softened cream cheese and eggs to a stand mixer. Turn on to medium low, and allow the two ingredients to fully combine. Add sugar, vanilla extract, lemon zest and juice and continue to blend until all ingredients are smooth and creamy. Use a spatula to scrape down the sides if necessary. 6. Spoon the cream cheese mixture into the crust. Drop spoon fulls of the blueberry mixture on top. 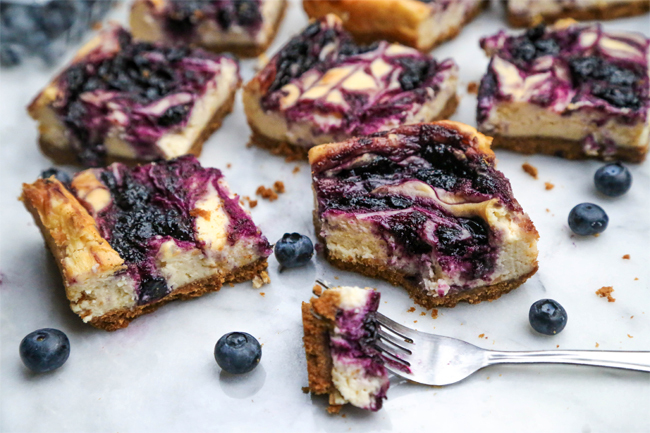 Use a chopstick or knife to swirl the blueberries across the cream cheese filling. 7. Place in the oven and bake for about 35-40 minutes. The sides of the bars will become puffy, and golden brown. As the bars cool, they will begin to sink. Allow to cool at room temperature for about 1 hour, then transfer them to the fridge to cool for about 2-3 hours. Remove foil and bars from the pan, and cut into squares. Enjoy!